Hello beautiful earthlings! As promised in my last post, I would post something this weekend. So here it is. 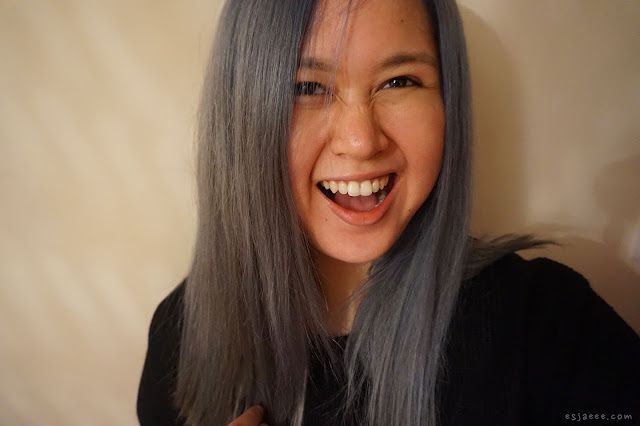 I HAVE FINALLY DYED MY HAIR GRAY! So some of you might ask why gray? Well, as a Final Fantasy fan I always admired the characters' cool hair and hair colour. 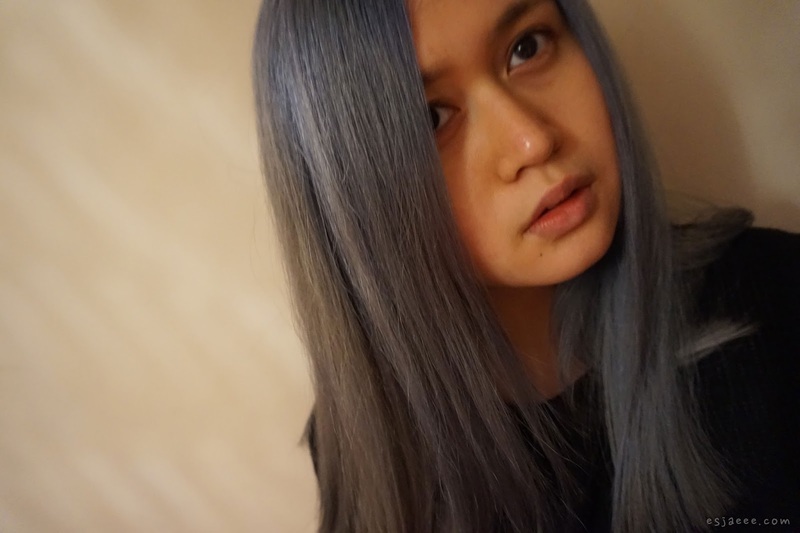 And having gray hair is also such a trend in the last year that I wanted it. 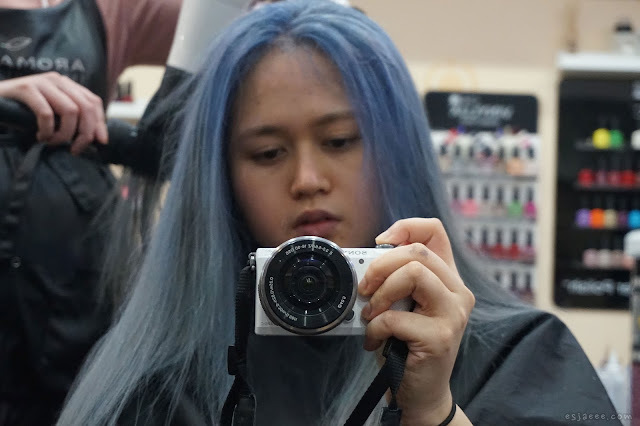 Also, since it is my last year in college, might as well take advantage plus my workplace does not mind employees with crazy hair colour. I haven't done anything to my hair since I last dyed it blonde which was 5 months! Again, you might ask how did you stand the roots? Well, first of all, getting your hair done is expensive and I needed to prioritise. 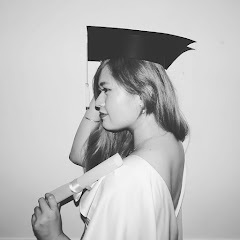 It was between me getting my hair done couple months earlier or pay the rest of my tuition fee. It was a no brainer. My natural hair colour is extremely black. The contrast of my bleached blonde hair and jet black roots was not flattering at all. I went again with Charming Hair Salon. Since they did a great job of getting my black hair to ash blonde really well, I figured going again with them won't hurt and I would avoid disappointments. My sister and I got there first thing on a Sunday morning. Marina took care of me. She asked what I wanted done. 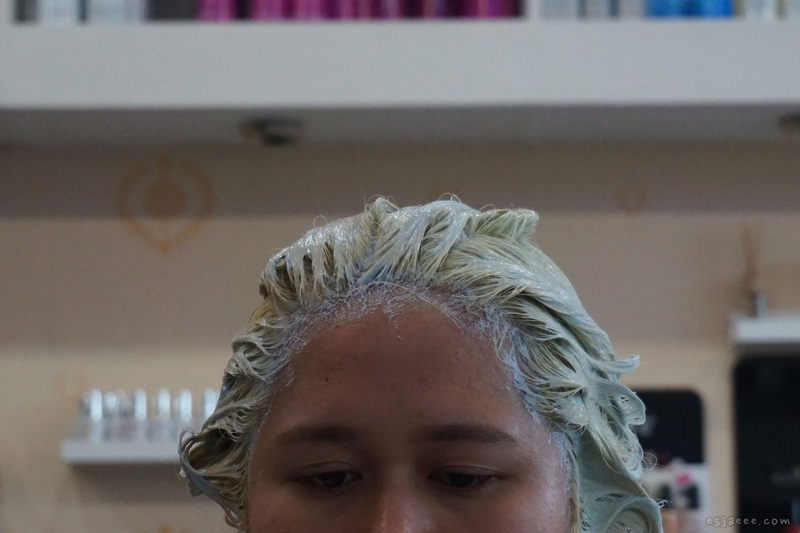 I wanted a trim so she roughly trimmed my hair first then proceeded with bleaching. She suggested that she will bleach my roots first then bleach my hair all over with Schwarzkopf's BlondMe bleach which was an additional €5 which I did not mind. She explained that BlondMe lifts 9 colours out of the hair and it would be less damaging. Marina applied the bleach to my roots and I waited for about 30 minutes for the bleach to lift the colour out of my roots. After that, she washed my hair, dried it and applied bleach all over my hair to really lighten it. The second bleaching process stung a bit but it was bearable. I waited for about an hour for the second bleach and I was platinum at the end of it. 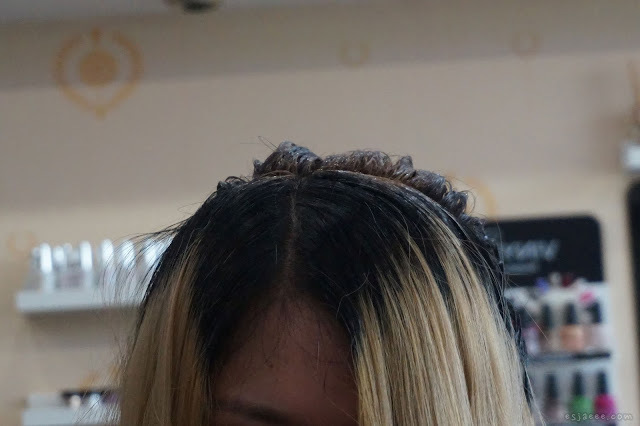 After washing my hair, they applied toner and the colour. I chose gray with a hint of lilac. I could not remember the brand of dye they used so I am sorry. They applied the colour and it was a little too light for my liking so I told them to darken it a bit. I always believe that I have a high pain tolerance but man the process of adding toner to my head hurt so much that I was almost in tears! It was worse than the first session when I turned blonde. The stingyness lasted for about 15 minutes. I told them that it stung and they tried their best to make it better. So this what my hair looked liked when I told them to darken it a bit. It looked very blue at first and when wet. But it turned blue-gray after drying it. 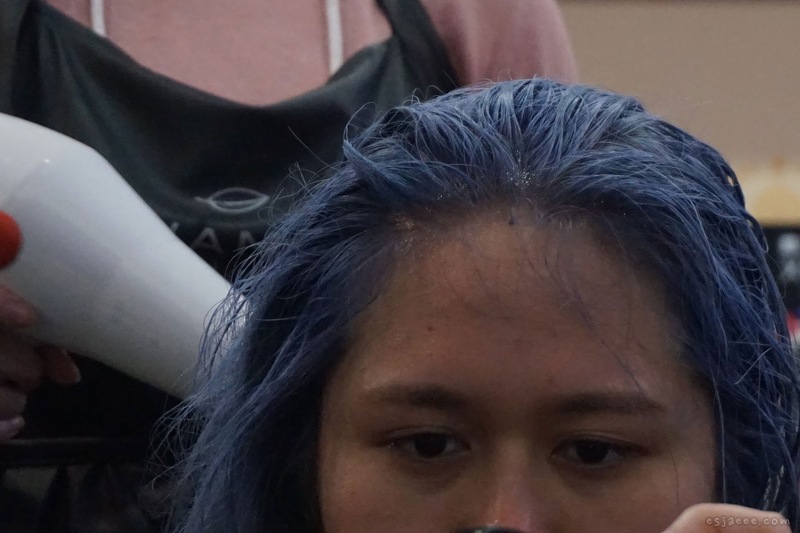 The blue was more concentrated at the roots then lighter towards the ends of my hair. My sister was not fond of how it turned out but I was pleased with it. I spent a total of 6 hours getting my hair done! It was a lot of time but it was worth it. I took this photo under incandescent light which made my hair look grayer than usual. I felt like I was Agua from Kingdom Hearts! When I came home, my brother asked why I wanted to look like Noct! 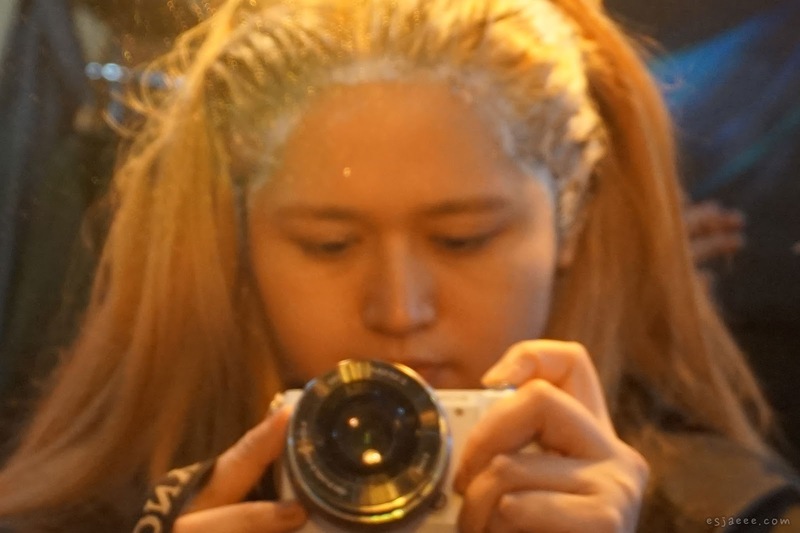 Haha Marina advised that I should continue using silver shampoo to keep the brassiness at bay and to deep condition since it was drier than usual but it was not bad. It still felt like it was my hair. The only problem when getting it done was my scalp. It hurt and I had irritation after the sessions. My sister's friend had a nightmare incident when he got his hair done to gray. His scalp was very irritated. In my case, it was the same. I had irritation which I already expected since I researched a ton before going blonde and then going gray. Doing this will take a toll on your scalp. I came prepared and I knew what to do after which was to not wash my hair for at least 3 days to bring the natural oils from my roots. On the 2nd or 3rd day, the irritation levelled off and my scalp was back to normal on the 4th day that I washed it. So I suggest to those who are looking to go gray when you have dark/black hair like me is to be prepared and research! Getting so much bleach and other chemicals on your head will definitely irritate the scalp.